Floats, stakes, and/or stands. 6.25” diameter. Smart circuit turns on at dusk – off at dawn automatically. 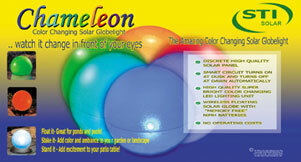 Discreet high quality solar panel Wireless floating solar globe with memory-free NiMH batteries. 4 pack. 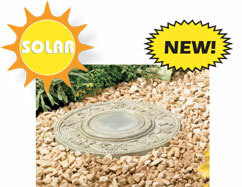 Solar powered decorative lights are ideal for decorating shrubs or flowerbeds around the pond. Powered by a separate solar panel allows lights to be placed in shady area. One red LED per ladybug. Up to 8 hours of light each night when fully-charged. Replaceable, rechargeable Ni-MH battery. Stake mounting allows lights and panel to be eaily located. Each ladybug measures 6.7” long x 4.7” tall. Powered by High Performance Monocrystalline Solar Panels, super bright white LED lighting unit can be permanently installed in concrete – making it idea for pools, decks, and driveways. Rechargeable/replaceable NiMh batteries. Removable top for cleaning and battery access. Measures 5” diameter x 2.1”D. Features twin amber LEDs. Automatically illuminates during darkness. Powered by in integral solar panel providing up to 8 hours of light per night. 2 yr warranty. 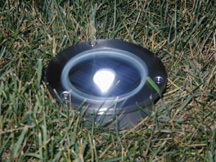 Advanced Optics featuring eight green LEDs in an adjustable solar spotlight. Powered by High Performance Monocrystalline Solar Panels. Rechargeable/replaceable NiMh batteries. Measures: 7.1” x 7.5” x 18.2”H. Clear Mosaic Inlaid Glass Lights are ideal for tabletops in the garden, patio, or deck areas. Mosaic glass creates pleasing lighting effects on any surface. Powered by integrated solar panel. Energy saving white LED. Replaceable, rechargeable Ni-MH battery. In winter, or low-light, light can still be used with a standard tea light or candle.